That time we took our toddler to Thailand and let him eat insects at the Laanta Lanta Festival in Koh Lanta. The Laanta Lanta Festival is held every March in Lanta Old Town. It’s a great way to learn more about the three ethnic groups that live on Koh Lanta: Chinese, Muslim, and Sea Gypsy. There is lots of great food to taste, traditional dancing and live music all evening. 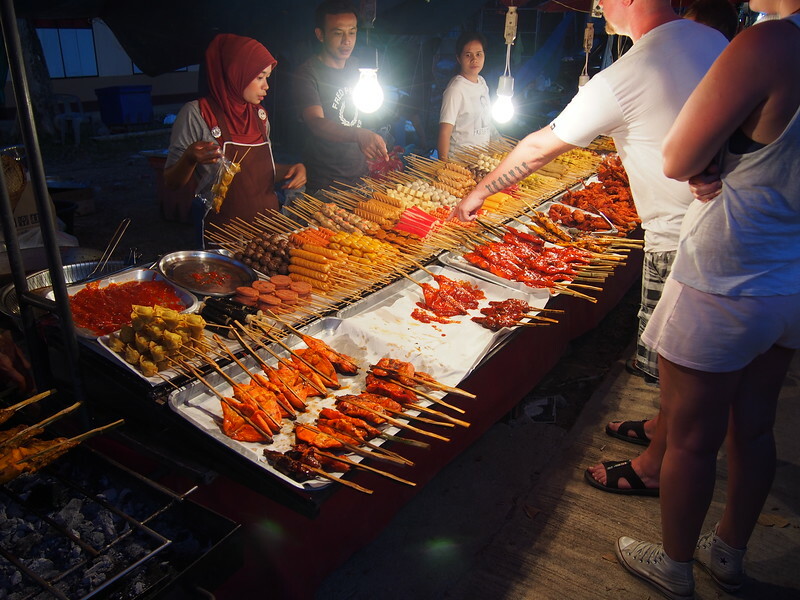 We were happy to see a wide variety of food available after being unsuccessful in finding any street food on Koh Lanta the previous week. 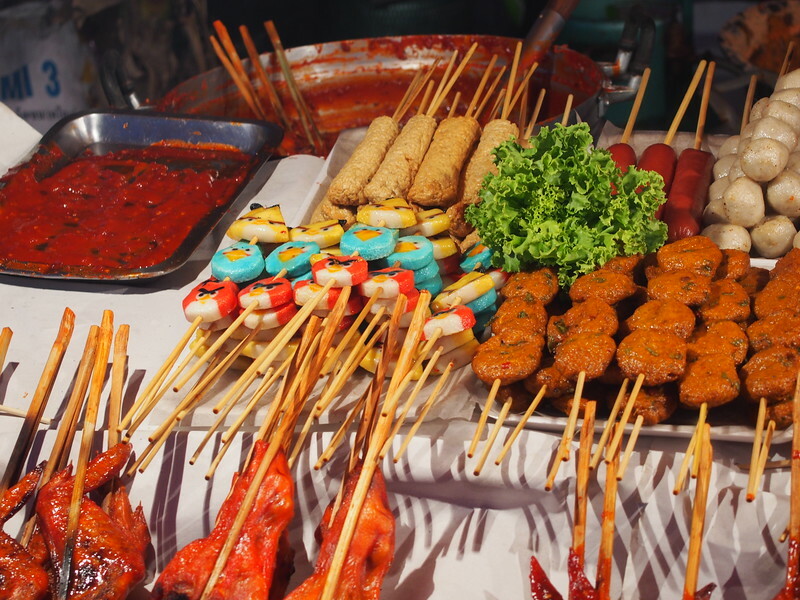 Like most of Thailand, there was a lot of meat-on-a-stick and seafood but I also saw several vegetarian options clearly marked. Food at Laanta Lanta Festival. Angry Birds on a stick. 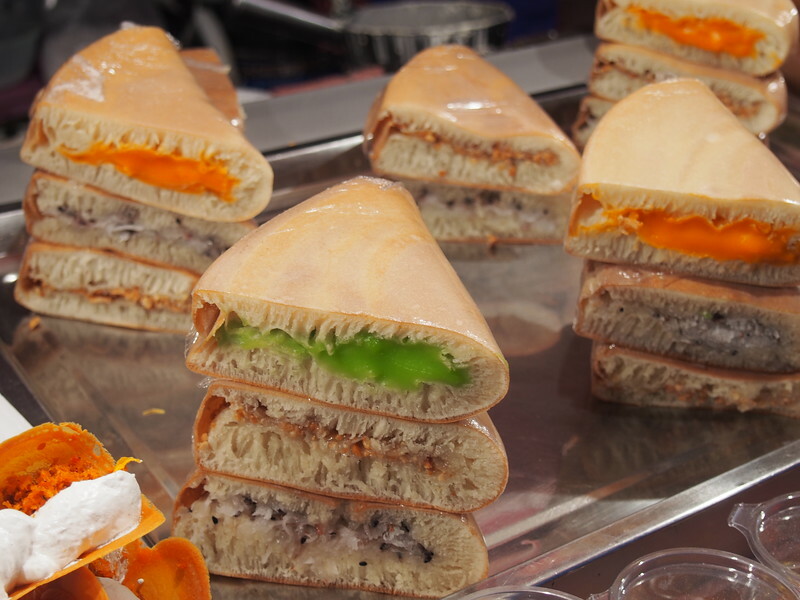 I think those are made out of fish balls. There is also a wide variety of insects for the more adventurous. Two spoonfuls for 20 baht. 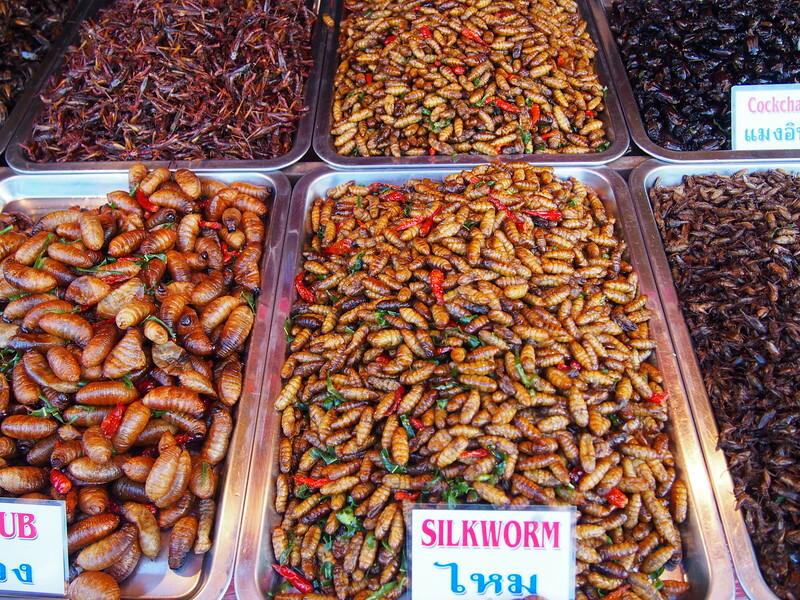 Despite having visited Thailand and Cambodia several times, I had never tried any insects. I am primarily a pescatarian but I also recognize that eating insects is a more sustainable source of protein for the world than other meats. I had always wanted to see exactly what they taste like. I decided on the silkworm pupae because I had seen frozen ones for sale in Asian food stores while living in Prague. It cost 20 baht for two spoonfuls and the vendor sprayed them with soy sauce and sprinkled a little salt. The texture was soft and almost cottony, nothing gooshy. They tasted primarily of salt and soy sauce, maybe a hint of a nutty flavour underneath. Of course, if Little Nomad sees me eating something, he always wants a bite too. I gave him one and he reached for more so we shared the rest of them. This video got a negative reaction from friends when I posted it on Facebook but rest assured that if he didn’t like the silkworms, he would have spit them out. He knows what he likes and doesn’t like. The primary reason I wanted to come to Laanta Lanta festival was to hear some traditional Sea Gypsy music. I looked everywhere for information online and could not find a schedule. I asked the guy running the soundboard on the side stage and he assured me that the Sea Gypsy music would be on the side stage but could not tell me what time. We stood there for hours, watching traditional dancing, a jazz band, a reggae band and some fire dancing. Little Nomad fell asleep in his pushchair. We had to give up waiting around 11:45pm and take the baby home. I’m still pretty disappointed that I didn’t get to hear any traditional Sea Gypsy music. I took a lot of low quality video on my iPhone but haven’t had a chance to edit it yet. I might upload it here when we get somewhere with a better internet connection.